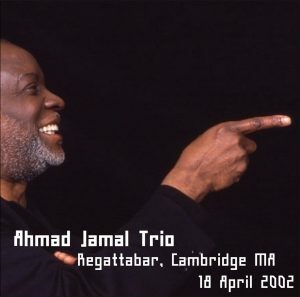 in 2002, ahmad jamal played three nights in a row at the regattabar in cambridge, ma, which were all shared on dime by ‘microburst’ back in may 2012. they’re very good recordings, and a lot of music: the first night is just under two hours, and the next two nights are around 2hrs 45mins each, as ahmad jamal played two sets each night. here’s the first night, 18 april 2002 — stay tuned for the 19th & the 20th. the band played 2 sets but the venue only charged for a single show (i.e., no early and late shows).